Wow, this is cool in so many ways! Nowadays even comets that become bright are discovered months to years before perihelion and usually by professional surveys. The latest comet to be discovered is sort of a throwback to the old days of comet hunting. For starters, the comet was relatively bright at discovery (10th magnitude, though recent observations suggest it may have brightened to 7th or 8th magnitude). Also it was found by three independent amateurs and now shares all three of their names. And lastly, one of the discoverers is our very own former Comet Section Coordinator, Don Machholz, who found the comet visually! C/2018 V1 (Machholz-Fujikawa-Iwamoto) has been officially announced on CBET 4569 and MPEC 2018-V151. The comet was found by all three discoverers within about 8 hours of each other. Don visually used a 0.47-m reflector at 113x while Fujikawa used a CCD + 120-mm-f.l. f/3.5 lens and Iwamoto used a 10-cm f/4.0 Pentax SDUF II telephoto lens and a Canon EOS 6D camera. The comet may be experiencing an outburst. Hence, why it was suddenly discovered as a bright object by three observers within ~8 hours of each other. It brightness behavior is definitely suggestive of an outburst. It was reported by Machholz at magnitude 10.5 at discovery. 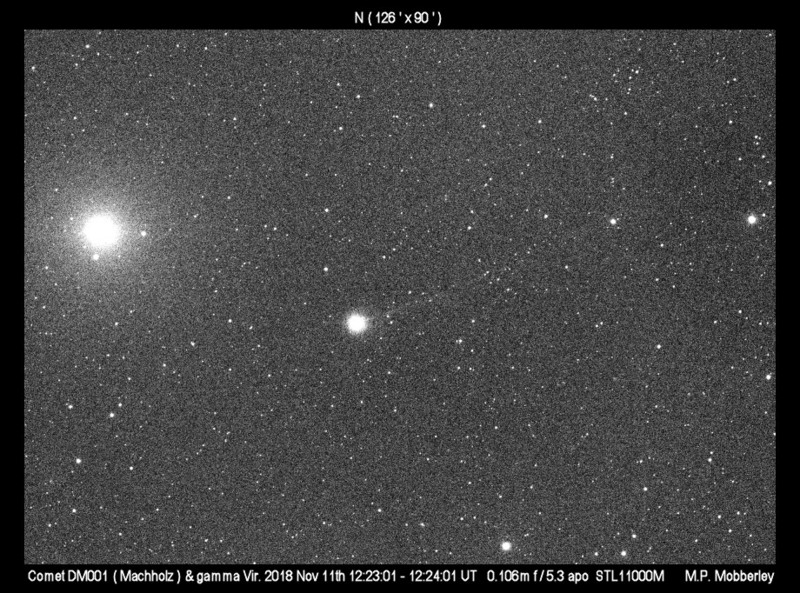 J. J. Gonzalez saw the comet at magnitude 9.9 on Nov. 9.22 UT while Chris Wyatt saw it even brighter at 8.9 on Nov. 10.72 UT. Charles Morris just posted an estimate on comets-ml from last night (Nov. 11.55 UT) placing the comet closer to magnitude 7.5! This is Don’s 12th discovery and first since C/2010 F4 after 746 hours of visual searching. His other discoveries include 96P/Machholz, 141P/Machholz, C/1978 R3 (Machholz), C/1985 K1 (Machholz), C/1988 P1 (Machholz), C/1992 F1 (Tanaka-Machholz), C/1992 N1 (Machholz), C/1994 N1 (Nakamura-Nishimura-Machholz), C/1994 T1 (Machholz) and C/2004 Q2 (Machholz). The comet is the seventh to bear Shigehisa Fujikawa’s name. He also independently discovered two comets in 1968, C/1968 N1 (Honda) and C/1968 H1 (Tago-Honda-Yamamoto). His other discoveries include C/1969 P1 (Fujikawa), C/1970 B1 (Daido-Fujikawa), C/1975 T1 (Mori-Sato-Fujikawa), C/1983 J1 (Sugano-Saigusa-Fujikawa), C/2002 X5 (Kudo-Fujikawa) and a rediscovery of comet 72P/Denning-Fujikawa. This is Masayuki Iwamoto’s second comet after C/2013 E2 (Iwamoto). The comet marks the first visual comet discovery in almost exactly 8 years since the discovery of 332P/2010 V1 (Ikeya-Murakami). It is also the first comet to bear three names since C/2015 VL62 (Lemmon-Yeung-PanSTARRS) and the first to bear three amateur names in 24 years! Don was involved with that comet as well [C/1994 N1 (Nakamura-Nishimura-Machholz)]. The MPEC 2018-V151 orbit makes C/2018 V1 a long-period comet with perihelion on December 3 at 0.39 AU and inclination of 144 degrees. The comet was too close to the Sun to be seen until a few weeks ago. Unfortunately, it will drop back into the glare of the Sun in another week or two. After that the comet will not be visible to northern hemisphere observers. Southern hemisphere observers should be able to image the comet again starting next February. I say imaging since the comet will then be much further from the Sun and Earth at that time. Currently the comet is a morning object in Virgo, C/2018 V1 can be seen a degree to the east of the well known variable star Porrima (gamma Vir). Congratulations to Don, Fujikawa-san and Iwamoto-san! Below, a 60-second image of C/2018 V1 (Machholz-Fujikawa-Iwamoto) was taken by Martin Mobberley via iTelescope’s T14 FSQ106 telescope in New Mexico.